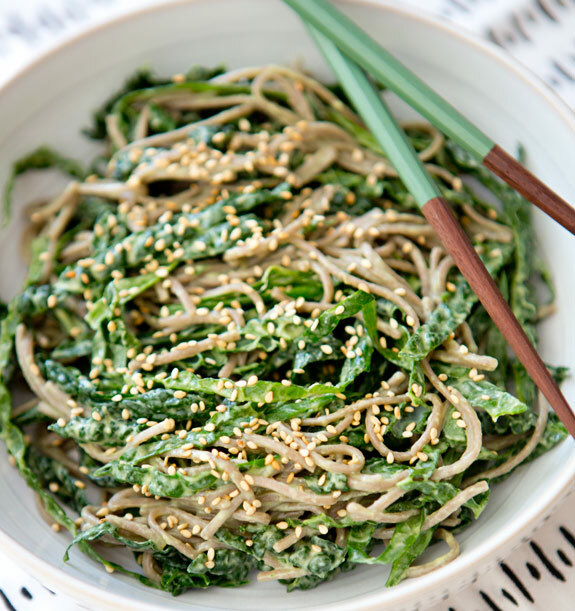 – while noodles are cooking, de-stem kale and cut into ribbons. set aside. this was great! I didn't have avocado so i used crunchy peanut butter. I've made it twice … Once with white miso and once with red … Both tasted good but the white miso definitely looked better … Both times I blanched the kale in the same pot as the noodles for a couple of minutes and enjoyed the result … Served with seared tuna … Thanks for the recipe! looks delish! I am seriously coveting those chopsticks- chopstick envy!!! yum! this looks awesome and like something you'd order out. gorgeous photos! you had me at noodle. Looks lovely! Very similar to a Korean recipe I've made. For a little added protein, try tossing in some crumbled firm tofu! thanks everyone! @shauna our friends brought them home from japan! i love them so much! Mmmmm, this sounds a gorgeous combination of tastes!! i love – looks delicious! This looks awesome. We've been eating too much chicken in my house the past few weeks, I'm craving green things! This sounds really crisp and yummy, and like just what I need! I love the idea of cutting the kale into noodle-sized ribbons! It makes this dish so gorgeous! I'm actually going to try this, as soon as I get my hands on an avocado and some kale. Plus chopsticks are so much fun! oh wow. 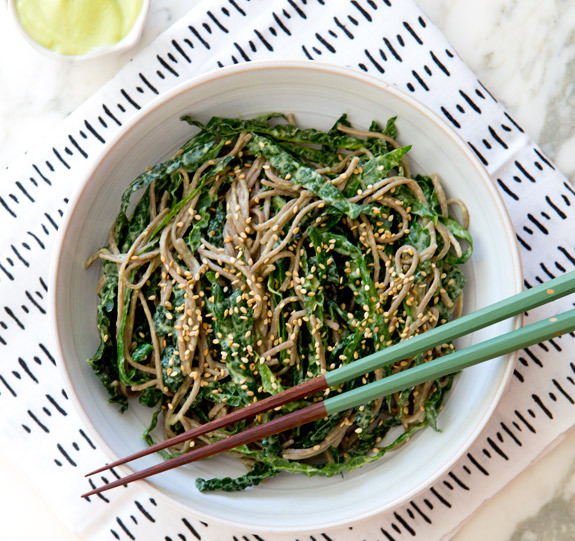 two of my favorite things: kale and soba – yum!! I made this last night with arugula and spinach from the garden. Wow. The sauce is fantastic! how do you think red miso would effect the flavor, as that is what I have in my fridge right now. my mouth watered as soon as I saw this! I made this yesterday for my boyfriend & I with the nori wraps for lunch. Both were DELISH! Thank you for posting yummy, easy, healthy foods! I added sauteed shiitake mushrooms & a little chopped purple cabbage to this! It was delicious! why do you rinse the noodles off with hot water? hi wendy! i rinse them off to get rid of the starch after cooking… hope that helps! About to make this with kelp noodles!! Very excited…. The result was a tad disappointing… Maybe blanching the kale before? What a great recipe! I was looking for some inspiration for a healthy lunch and this was a delicious combination of ingredients. Thanks for sharing! Love this recipe! I think I'm going to top it off with some garlic sesame baked tofu! Mde this last night, had to make a few adjustments since I could not get the exact type of miso, however it was wonderful!!!! My husband and I made enough for lunch the next day but ended up with no left overs! We ate it hot but he tried it cold for lunch and it was very tasty that way to. A great healthy recipe that takes no time to make. This recipe looks amazing!! I don't have white miso, its a light yellow color that I got at an small Asian market. Will that work for the dressing? I just want to say "thank you!" for this beautiful recipe. I make it at least a couple times a month. I like to add in cut-up roma tomatoes (I de-seed them first) and toasted pine nuts. So delicious! Just made this tonight and it was SO good! The avocado miso dressing is going to be my go-to now. Thanks! Just made this dish and loved it! Aloha! I love iit when folks get togethr and share ideas. Great blog, keedp it up! Thank you for this great recipe! I had eaten my ripe avocado for lunch but read Kelley’s idea of using peanut butter. I used tahini. Tahini and sesame oil instead of olive oil. It worked great. I’m going to make it again now with the avocado. I really like this sauce! My sister usually adds smoked salmon to make it a more filling meal… can anyone suggest other protein options? I just discovered your site from Well + Good. This recipe looks amazing, can’t wait to try. I was just wondering if you considered adding nutritional information (i.e. calories) to your recipes? I loved the dressing by itself, but the kale seemed to overpower the flavor, once it was put together. I added red pepper flakes and a little salt, but perhaps the kale needs to be cooked first, or at least massaged? I didn’t use “dino” kale; maybe that would have made a difference. I’ve never heard of “dino” kale before, though…. Oh perfect! I have loads of buckwheat noodles and was wondering what to do with them! Thanks! 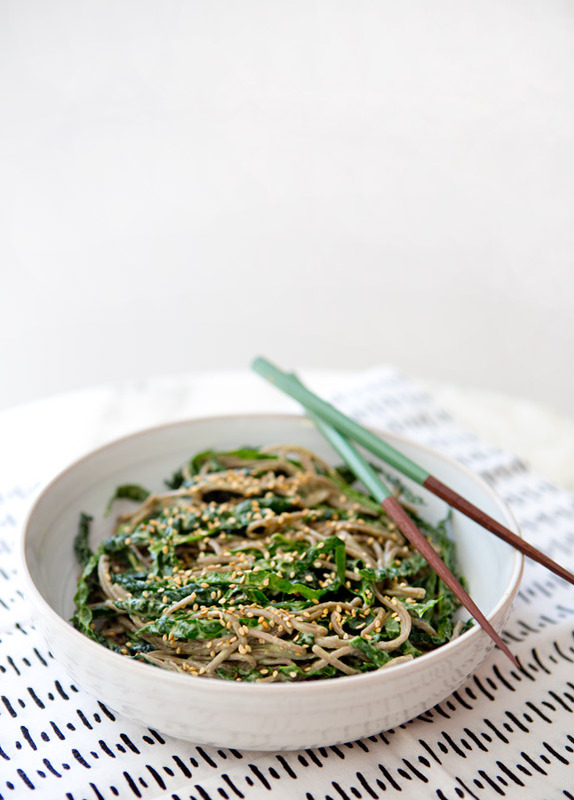 The avocado dressing on this is so lovely, creamy, savory, tangy, and rich; the perfect compliment to nutty soba and ever-so-bitter kale. This was great, although I felt the dressing needed a bit more tang so I added some rice wine vinegar and it livened it up. Also using black sesame seeds instead of the regular ones makes it very pretty. Thank you! Great recipe! As a previous commentator suggested I added sautéed mushrooms. Also I’ve left out the olive oil and added a little water and sesame oil to the dressing instead, yum!!! Tried as directed. Even added extra garlic and lime. Horrible! !